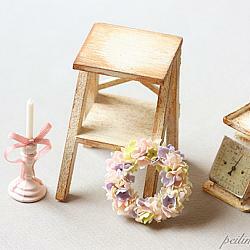 A beautiful stunning looking dollhouse miniature mixed flower wreath in 1/12 scale. 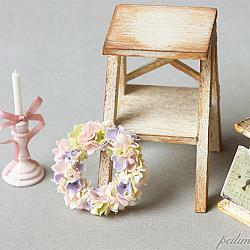 A dreamy looking, elegant flower wreath to make a beautiful collection to your dollhouse. Handmade by me using air dry clay. This is a beautiful highly realistic full bodied wreath, so it looks beautiful from all angles. Makes a grand statement when hung on the dollhouse door or wall, or even by the front porch. Use this in your shop house, or even in any dollhouse prop setting. Please note that all other accessories are not included in the purchase. Measures approximately 3cm in diameter and about 0.7cm thick. Item will be shipped via registered mail. Any questions, please do not hesitate to contact me. This item is only suitable for dollhouse miniature collectors and is not intended for young children. ©2019 peiliminiatures.com. All rights reserved. Powered by Shoppe Pro.